There are few better ways to close out a regular season than with solid wins over higher-classification teams. 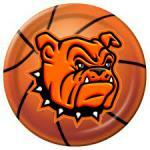 The Lady Bulldog basketball team’s victories Tuesday and Friday over Clovis and Roswell High respectively will no doubt give them team a shot in the arm as they head into a well-deserved week off and the start of District 4-AAAA play. Friday’s win over Roswell High was particularly exciting for an Artesia squad that suffered more than their share of lopsided losses to the Lady Coyotes when the two shared a district. This time around, the girls in orange used an overall solid night from the field and a defensive effort that forced 19 Roswell turnovers to turn up the heat in the second half en route to a 55-31 win. “It was definitely exciting,” head coach Jeff Houghtaling said following the bout. “We didn’t shoot real well in the first half, but we shot good enough. Then in the second half, we kind of got into an offensive rhythm, changed up our defense a little bit, and I felt like it slowed them down. Roswell opened the contest with a pair of three-pointers that sandwiched two from the free-throw line by Paityn Houghtaling, but after that, the Lady ‘Dogs bounced back with a 8-2 run that included a bucket apiece from Brehnan Davis, Elliot Harrison, Makinli Taylor and Kaylee Wagner to take a 10-8 lead. 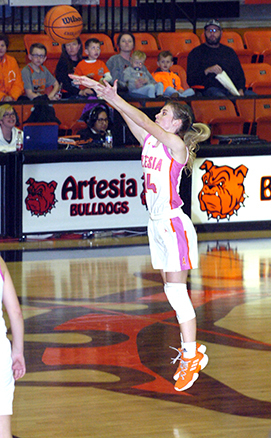 Davis dropped a three of her own at the 3:06 mark to help keep Artesia in front, 13-10, despite a scoreless final three minutes and a final basket by the Coyotes. Davis kicked off the second the same way she’d finished the first to make it 16-10, but following a Houghtaling free throw and a Davis jumper, consecutive treys by Roswell’s Cheyenne Martinez knotted things up at 19-all with 3:15 to go in the first half. Harrison fired off a longball 18 seconds later, however, to break the tie, and with a Faith Evans offensive putback and pair from the stripe by Lady Coyote Makenzie Tarin closing out the half, Artesia carried a 24-21 edge in at the break. While the Lady Bulldogs’ offense didn’t quite kick into full gear in the third, the squad stepped up their defense, forcing five Roswell turnovers and limiting the Lady Coyotes to just three field goals in the period. Davis followed a layup with a three in the early goings of the quarter, and a pair of baskets in the paint by Wagner and one from Taylor saw the Artesia girls up by six, 35-29, going into the final eight minutes. There, the Lady ‘Dogs finally found their groove offensively, ushering in the quarter with a 9-0 run that featured four points from Houghtaling, a Harrison three, and a shot in the paint by Taylor. Tarin would follow that rally with Roswell’s only basket of the quarter, while baskets from Taylor and Harrison, a Houghtaling and-one, and back-to-back buckets from Wagner closed out the contest, 55-31. Davis tied for top scoring honors on the night with Roswell’s Martinez at 15, followed for the Lady ‘Dogs by Harrison, Houghtaling and Wagner with 10 each. The win bumps the Lady ‘Dogs’ record to 13-7 to cap off the regular season, and the team will now have a week-plus to prepare for the second season, which begins at 5:30 p.m. Tuesday, Feb. 5, in Lovington. “We’re getting better,” said Houghtaling. “I’d like to think we’ve still got a little ways to go, but we have come a long way, and I think folks that watched us in December probably don’t recognize us here at the end of January. We’re a lot better than we were. I feel like we’ve gotten into a pretty good rotation with the kids that are playing and what they’re doing. Some nights, we’re getting a few more in than others, but the kids that’re getting the bulk of the playing time are really finding their spots in the offense and defense, and it’s all in preparation for district.